Many communities living in informal settlements in metropolitan municipalities in South Africa receive basic services such as water, sanitation and refuse removal from outsourced service providers. These services are generally temporary and range from the delivery of water using water trucks to the servicing and maintenance of chemical portable toilets. 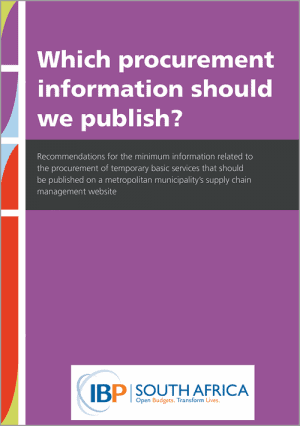 The lack of publicly available information on the public procurement of outsources basic services means that communities generally do not know the exact nature of the service they should receive, how often the service should be delivered, who to contact when the service is not being delivered, or who to contact when they are experiencing problems.